Do you want to quickly clean up your face in the limited time in the morning and get a fresh look? Are you struggling to find a professional quality cleansing brush? Do you still find a wonderful gift for your mother or girlfriend? This is the right one! Just 2 minutes, return you a clean face and good mood all the day. Homeasy aims to offer you an easy and convenient brush at an affordable price. Enjoy three treatments with one device. 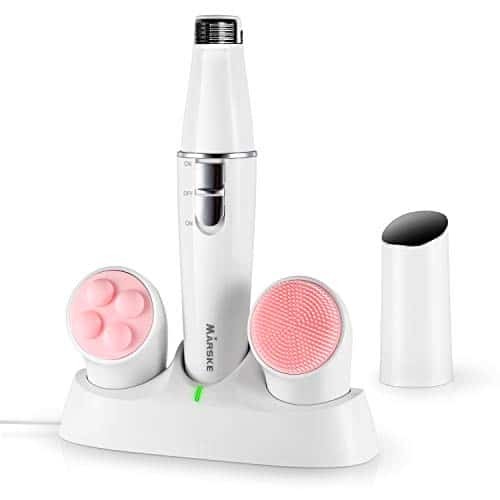 Precise facial epilation, pore deep cleansing and face massage. In just one minute it sweeps away make-up and impurities to restore your skin’s natural glow. With hundreds of micro-oscillations, it works far better than a manual wash and cleanses your skin pore deep so as to better absorb your favorite cream or serum. Your complexion can look visibly smooth, clear and fresh at the flick of a switch.100% waterproof, you can make facial cleansing a natural part of your shower routine. 2 speed setting for Gentle& Deep Cleansing. Do you need a high quality, innovative and effective nasal hair trimmer for men? 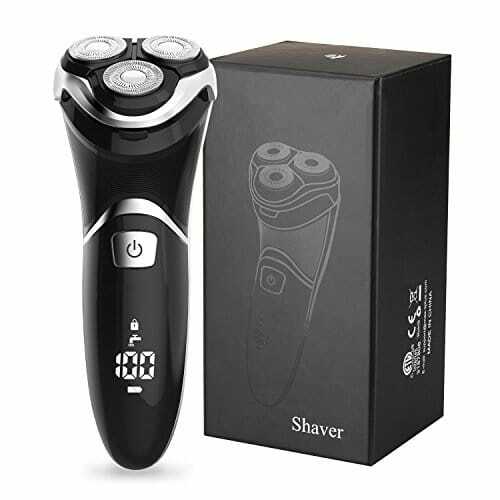 This nose hair trimmer for men was made to help you manage your grooming needs effortlessly. You can comfortably use this nose trimmer with vacuum cleaning system in the shower as its nozzles are designed for full water immersion. Featuring a refined dual blade system, this nose hair remover for men cuts better at nearly any angle and can easily get to those annoying and unsightly hairs in their hiding spots. Even if this is your first time of using a nose hair trimmer, you’ll be amazed at how easy it is to use this battery operated nose hair trimmer! No need to buy multiple trimmers for your grooming needs. Featuring a revolutionary micro vacuum system, this mens hair trimmer gives you the versatility and comfort to trim nose, ear, and brow hair. 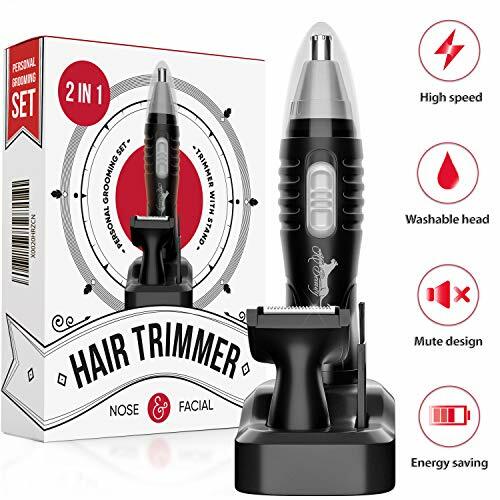 This nose hair trimmer cordless is not just safer and easier than scissors, it painlessly gets the job done and makes a stylish addition to any man’s personal tools. 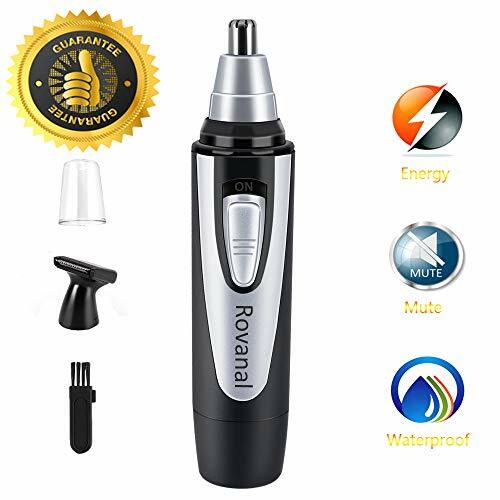 Thanks to our high-performance design and 360° rotating system, this nose hair trimmer waterproof provides accurate removal of ear and nose hair without any pinching, pulling or tugging. The portable and sleek design of this mens eyebrow trimmer makes it easy to handle and travel with. You can use it anywhere as it fits right in your small luggage when you are travelling. It comes with a small cleaning brush that makes it incredibly easy to clean after each use. It also comes with a dust-proof cover to protect the cutter head. Only the nozzles of this vacuum beard trimmer are waterproof. The trimmer’s body must not be lowered into the water. 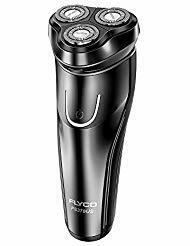 POWERFUL MUTE MOTOR: With a 6500 RPM motor, this beard trimmer for men & facial hair trimmer for men won’t pinch or pull your hair. This nose hair cutter does not make disturbing noise! IPX7 WATERPROOF DESIGN: Our waterproof design allows you to use this electric nose hair trimmer & nose hair shaver in the shower. Only the nozzles of this nose and ear hair trimmer for men are waterproof! 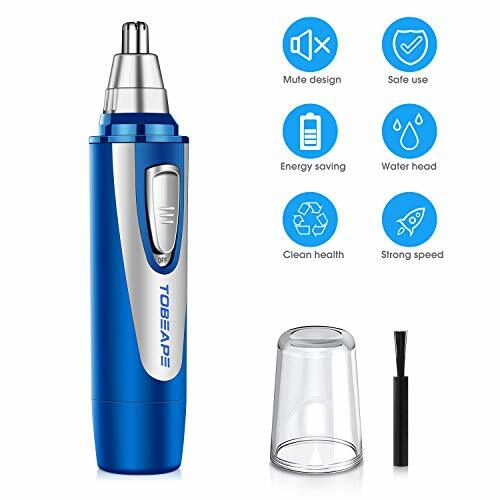 ADDITIONAL NOZZLE FOR HAIR AND BEARD: With 2 nozzles, this nose hair trimmer for men is the best nose hair trimmer for nose hair and beards. This nose hair remove comes with a stand for easy storage! 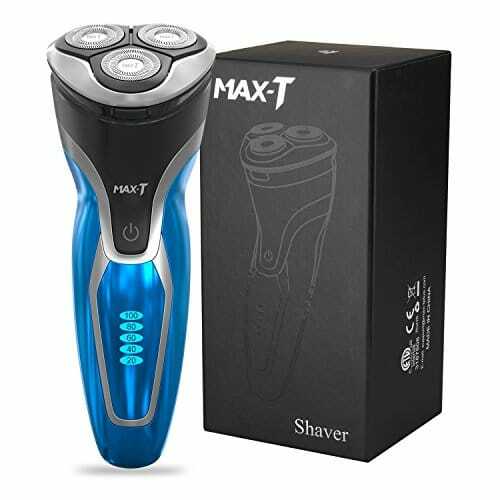 MAX-T excellent quality product with unique tech offers you a new comfortable close shaving feeling. Tips: All of our units come with 1 year full warranty to cover any issues, any problem please feel free to contact our after-sales team. 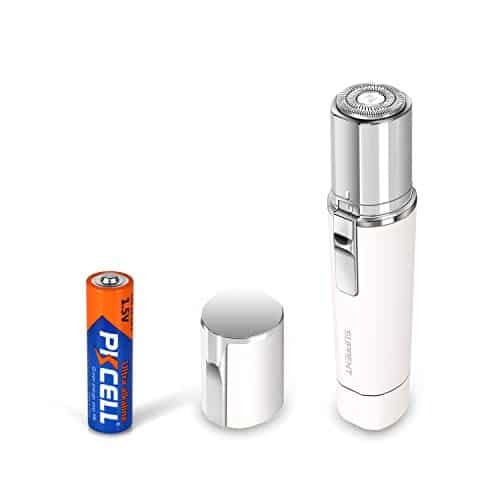 Quick Charge & Long Use Time – 1 minute fast USB charging technology support the electric shaver operating again.1 hour full charge for almost 2 months use (120 minutes shaving time). 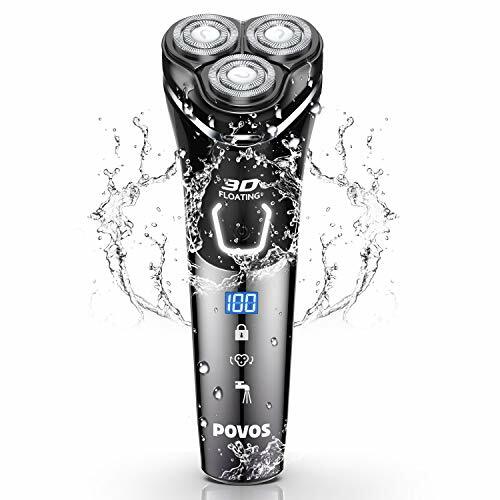 Ergonomic Design – Ergonomically designed handle for easier hold, with mute high speed motor and 4-direction flex heads, the 3D rotary shaver automatically adapts to the contours of the face, neck and even the jaw, so it provides a comfortable and close shave in low noise. Warranty – All of our units come with 1 year full warranty to cover any issues, any problem please feel free to contact us. 【Fast & Effective Shaver with 3D Floating Heads】- The FLYCO shaver uses 3 shaving heads and precision blades for fast and effective shaving. The flexible shaving heads which can adapt to the facial contour perfectly, guarantee a close-fitting skin contact. Dual-track foil increase the contact surface.You’ll catch more beard at one time. 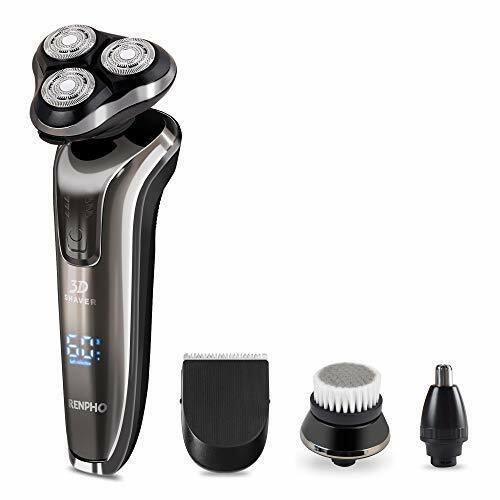 【Smart Shaving System It Gives a Skin Fade 0 and There’s No Pain】- Smart shaving system shaves long hairs and short stubble.smart sensor battery status, stable operation of the motor when the battery is low, smart anti-clamping beard. Allows you a comfortable with a smooth shaving process. 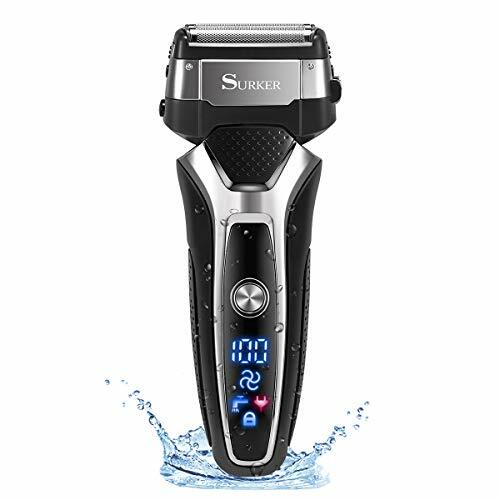 【IPX7 Waterproof Wet & Dry Electric Shaver】- Choose how you prefer to shave. The whole body of this electric razors is washable, you can opt a quick dry shave or a more comfortable wet shave with gel or foam,even under the shower to gain a refreshing and smooth skin experience. Detachable and washable head makes you easy to clean it directly under faucet.More convenient. 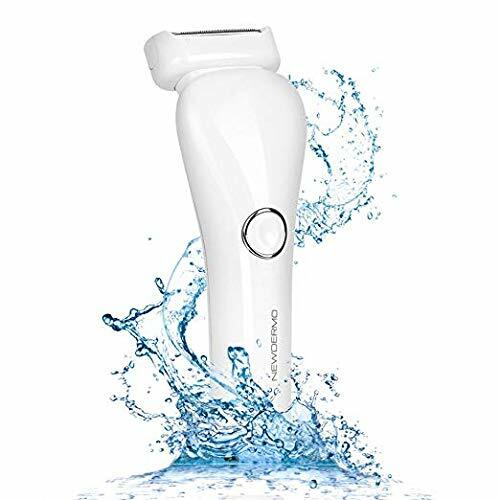 【Ideal Gift & Satisfaction Guarantee】 – Beautiful modern looking and smart design, Ideal gift for father,husband,boyfriend and son.We are so confident that you will love this Electric Rotary Shaver. We provide the 2 YEARS MONEY BACK GUARANTEE and 365 DAYS worry-free warranty.If you have any problem or suggestion, please kindly contact us freely, we provide friendly, easy-to-reach support for you.